Today's Noir was 'The Killers' (1946). An adaptation of Hemingway's 1927 hardboiled short story (one revisited in David Cronenburg's 2005 'A History of Violence'). The film is directed by German Director and UFA graduate, Robert Siodmak. Ufa (Universum Film Aktiengesellschaft) was the Berlin home, throughout the 1920s and 1930s, to Film Directors such as Fritz Lang, F.W. Murnau, Carl Theodor Dreyer and E.A.Dupont. Burt Lancaster stars in his breakthrough role as the sympathetic 'Swede'. Lancaster later confessed to finding his kissing scenes with Ava Gardner 'deeply stirring' and to being so nervous that he needed 15 takes during some scenes. Edmund O'Brien, of D.O.A also stars as the investigator. 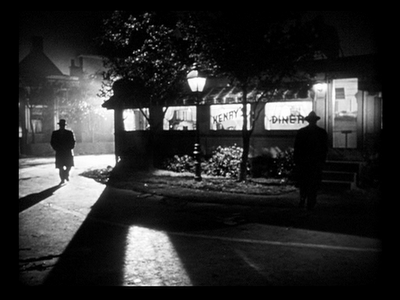 After the doomy, menacing, atmospheric opening scenes of the killers, Max and Al (played beautifully by William Conrad and Charles McGraw) finding and gunning down 'the Swede' (after ordering Ham and Eggs) the film's pace and mood lags a little, getting slightly lost in a welter of flashbacks and recollections. Using a non-linear structure that is similar to Citizen Kane's 'investigation' mode it becomes a little confusing and would probably benefit from a second viewing. Cinematographer Woody Bredell developed 'out of balance' lighting of heightened contrasts by not using the fill lighting that gave many contemporary films a dull grey look. The film was produced by broadway columnist, Mark Hellinger who, the following year, would partner up with Jules Dassin to make two further Noir classics: 'Brute Force' (again featuring Lancaster) and docu-noir, 'The Naked City' - for which he also provided the memorable voiceover ('There are eight million stories in the naked city. This has been one of them'). He died of a heat attack just before Christmas 1947. 'Don't ask a dying man to lie his soul into Hell'.